Just a quick update on my progress: I’m up to four completed tracks, though I currently only have a couple of ideas ready to expand upon. After finishing the track that I had in-progress on day 5, I started on an old-school ambient techno track, which I wrapped up yesterday, and today I recorded another ambient experimental track, using Argotlunar and TAL-NoiseMaker. The ambient techno track was good fun. 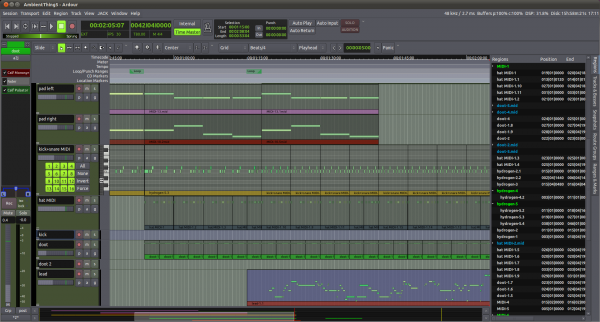 It started with loops in seq24, but with seq24 having poor support for JACK transport, I moved the work in to Ardour. As it turned out, that was pretty easy — seq24 saves its sessions in standard MIDI format, and when I imported the seq24 file in to Ardour, it imported each loop as a separate region on a new track, so I just had to do a bunch of copying and pasting to get the basic structure in place. 17 days and 6 tracks to go! I’ve been posting tracks to Soundcloud as I go; you can check them out here. I’ve been uploading them to Bandcamp too, of course, but hidden — if all goes well I’ll have a finished RPM album there, ready to reveal, on March 1st. As I mentioned previously, I’ve been playing with Ubuntu on my 2011 Macbook Air, and I’m happy to report that it’s now much more usable than when I first installed it. There’s a kernel module hack that fixes the display issues, allowing the Intel driver to run at the panel’s full 1440×900. Having the Intel driver running instead of the fbdev driver means that OpenGL and visual effects (and Unity, if you’re in to that sort of thing) work, as does brightness adjustment, and I suspect it’s the reason that suspend and resume now work, too. Patching the kernel manually would be a pain, but the (updated) setup script from the Ubuntu forums now takes care of this for you, along with the keyboard and trackpad driver patches. 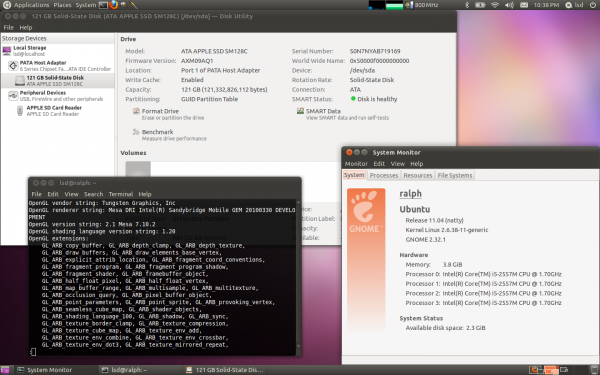 I also had a chance to test the Ubuntu 11.10 beta. I haven’t tested it with the video fix above (though it is supposed to work), but I did notice that the my 5Ghz 802.11n network worked with it, so it seems like the 5Ghz issues I’m having with 11.04 have been fixed. All of the important stuff is working, then, at least for my needs. There are some minor keyboard niggles — I haven’t been able to adjust the keyboard backlight brightness, and the volume keys are incorrectly mapped — but the biggest issue is with the trackpad. It works, including two-finger scrolling and two- and three-finger taps and clicks, but it doesn’t feel quite right, particularly when scrolling. It seems like a minor thing, but the trackpad is central to the user experience, and when basics like button presses and scrolling rely to a degree on gesture recognition, it matters a lot that they’re detected reliably and respond appropriately. The multitouch driver is under active development, though, so I have no doubt it’ll improve. I really enjoying benchmarking this thing, just to see how much power has been crammed in to it. Compiling Ardour 3 from SVN seemed like a good test of overall system performance: it managed it in 14 minutes and 50 seconds, just under two minutes faster than my 3Ghz Core 2 Duo desktop. It’s definitely no slouch! With Ardour 3 alphas coming thick and fast, and the beta looming on the horizon, I thought it was high time to examine the soft-synths that are available for use with it. While support for other synth plugin formats, like DSSI and native VST, may come in future releases, Ardour 3.0 looks set support only LV2 synths (though it of course supports LADSPA for effects, too). 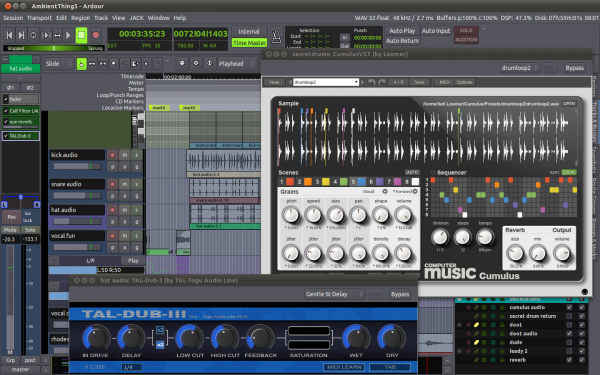 That obviously limits the selection somewhat, but there are still some nice synth plugins on offer. Of course, Ardour 3 works just as well with external JACK synths, and with hardware synths, so you can still use old favourites like Hydrogen or Yoshimi, but using plugins certainly makes things easier when saving and loading projects. NOTE: Some of these synths rely on a library called lv2-c++-tools. Versions of this library before 1.0.4 include a bug that prevents Ardour from loading any synth plugins built against it, so if some of the synths listed here fail to load for you, make sure you check your lv2-c++-tools version. The Calf plugins are some of my favourites — the Flanger, Phaser, MultiChorus, and Vintage Delay are all great — and it comes with a couple of synths, too. Calf Monosynth is a classic analogue-style monophonic synth; it handles legato just like an old monosynth, which is something that a lot of soft-synths mess up, so it’s great for both electro basses and proggy leads. 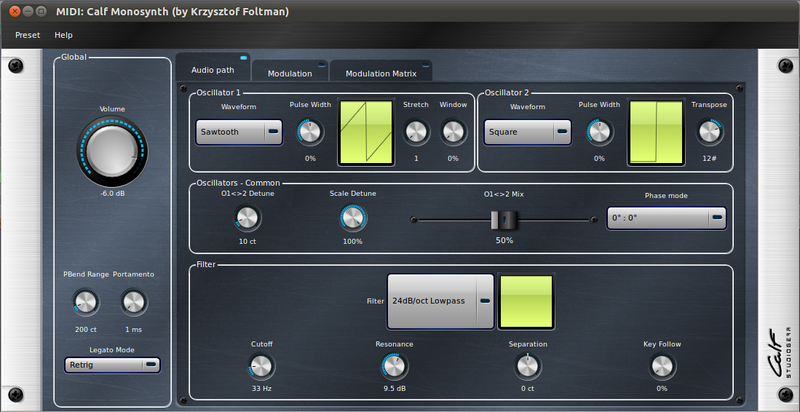 The git version adds LFOs and a modulation matrix. Calf Organ is based on a drawbar organ; rather than emulating a specific organ it takes the basic idea and expands on it. You can adjust the harmonic and the waveform of each drawbar, and independently pan and detune them, too. It also has a pair of resonant filters, and three envelopes for modulation, which make it capable of all sorts of synth sounds beyond what you’d expect from an organ. Calf Fluidsynth does what you’d expect it to do — it lets you load SF2 soundfont files, using the Fluidsynth engine. It’s only available in the git version of Calf, and it’s marked as experimental, so you have to enable it explicitly when configuring the build. Despite all that it does seem to work, though I haven’t had a good chance to really put it through its paces yet. If you do want a classic organ, foo-yc20 may fit the bill — it emulates a Yamaha YC-20 combo organ, down to the tacky red background in the UI. It does a great job of emulating those cheesy 70s organ sounds, and it works really nicely through a chorus or rotary speaker plugin. 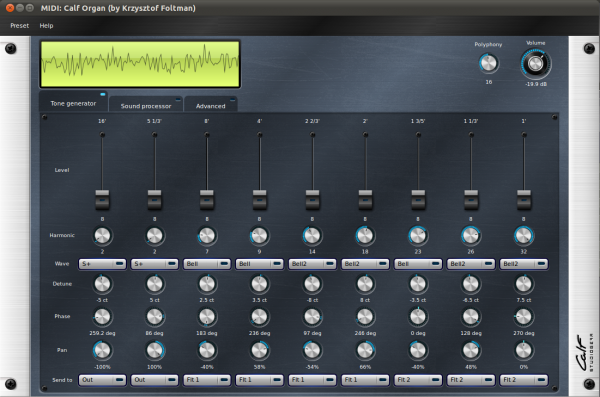 The MDA plugin set, which contains a variety of synth and effects plugins, has long been popular on Windows, and since going open-source a couple of Linux LV2 ports have appeared. Dave Robillard has ported the effects plugins, but he hasn’t yet started on the synths. The lv2-mdaEPiano project has ported one of the synths, though — the electric piano. 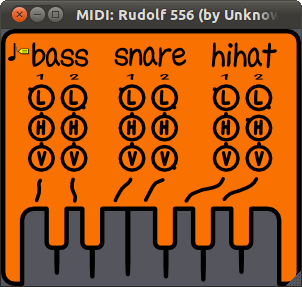 It’s a very nice little synth, with a great sound and low resource usage. 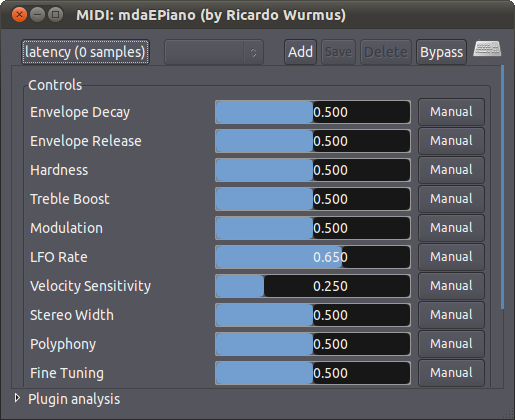 lv2-mdaEPiano has its own GUI, but it’s a bit plain — I actually prefer Ardour’s standard plugin GUI controls. Thankfully, you can bring up a standard Ardour GUI for it (or any other plugin, for that matter) by right-clicking on it in the plugin list and selecting “Edit”. lv2-mdaEPiano uses lv2-c++-tools, so make sure you’ve upgraded that to 1.0.4 or later before installing it. SO-404: a single-oscillator monosynth; it’s similar to a 303, and while it’s not a strict emulation it certainly capable of the same kinds of sounds. SO-KL5: a “piano” synth — it uses Karplus-Strong string synthesis, and while it doesn’t sound a lot like an actual piano, it sounds really nice in its own way, but a bit of an electric piano-ish vibe to it. I wasn’t sure about using LinuxSampler as a plugin initially, but it actually seems to work quite well! When you add the LV2 plugin within Ardour, you don’t get a GUI — it just launches an instance of LinuxSampler in the background and defines a MIDI input and audio output. 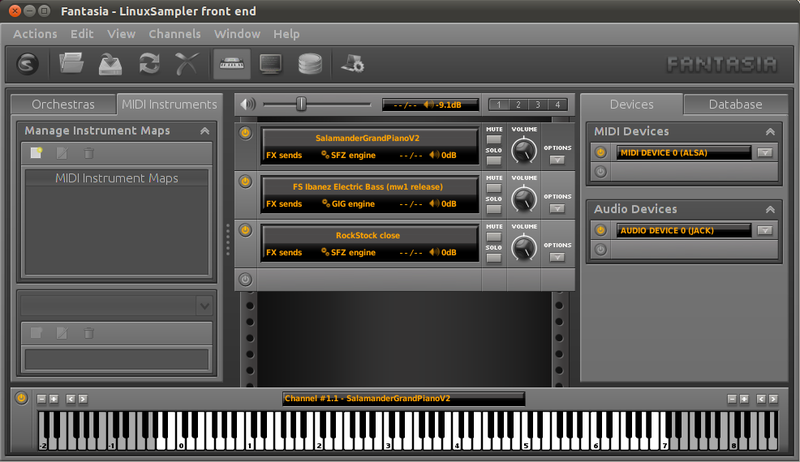 Then, you can fire up LinuxSampler’s Fantasia GUI to load the instrument you wish to use. It’s a little clunky, but the settings are all saved as part of the session and restored when you reload it, just as you’d expect with a plugin. I’m not sure how to describe this one, though words like “bizarre”, and perhaps “insane” certainly come to mind. The Newtonator uses some unique forms of synthesis, which are extensively, and entertainingly, in its manual. Its sound starts off as a simple sine wave, but after a few quick adjustments of some of its modulation parameters you find yourself knee-deep in some rich, distorted sonic mayhem. 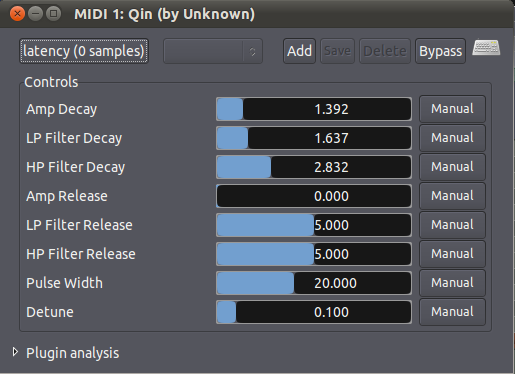 Like SO-KL5, Qin is a little string-based synth; it simulates plucked strings using a pair of oscillators and a pair of filters. Being monophonic limits its usefulness, but it can make some nice sounds. The ll-plugins plugin set contains two quite unique synths: Sineshaper, a monophonic synth based (unsurprisingly) on sine waveshapers, and Rudolf 556, an analogue drum machine emulation that creates bass, snare, and hat sounds. Even with the updated version of lv2-c++-tools, Sineshaper doesn’t work in Ardour for me, but Rudolf 556 does. 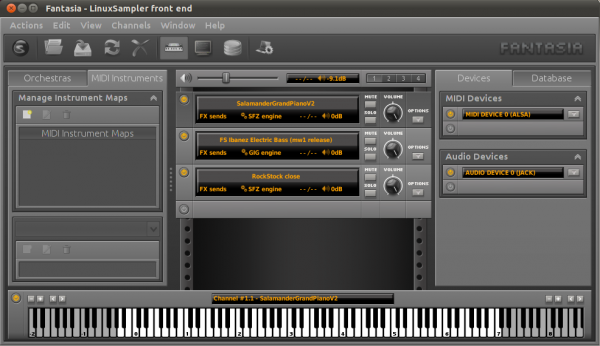 Composite Sampler is the plugin component of the Composite project, which aims to create a realtime sampler and sequencer based upon Hydrogen. The sequencer itself isn’t usable yet, but this plugin, which plays Hydrogen drum kits, works just fine (as of version 0.006.1). With no GUI to speak of it’s a bit fiddly to use, but the release announcement includes basic instructions. Minicomputer-LV2: this is a work-in-progress LV2 port of Minicomputer. i don’t think it’s in a usable state yet, but it’ll be awesome when it gets there. Calf has another “experimental” synth, called Wavetable, which I assume will be modulatable wavetable synth, like those from Waldorf. It doesn’t actually work yet, though, so we’ll just have to wait and see how it develops. 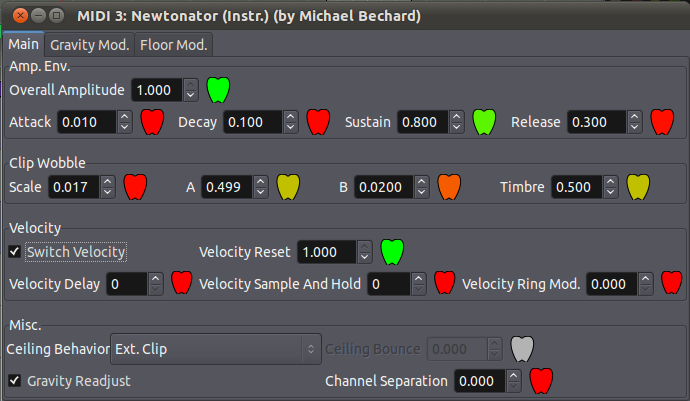 lv2_guitar: another string synth; thanks to Jeremy’s comments below I was able to build it, but it won’t load in to Ardour. Zyn: this project aims to port the various synth engines from the almighty ZynAddSubFX to LV2. I haven’t had any luck getting Ardour 3 to load it, though, and I’m not sure if it’s actively maintained. Have you had better luck with some of these? Have you found any that I haven’t listed? If so, let me know in the comments!